ECT Test Probe oplossingen bij Romex BV. 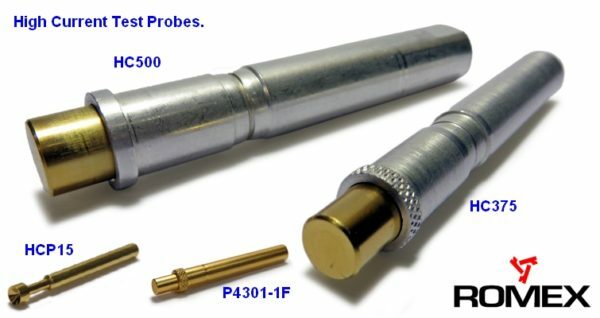 Test probe – test pin – spring probe – pogo pin; these are all generic terms to describe a component that traditionally is used to make contact with printed circuit boards (PCBs) or electrical components, in order to test functionality and to measure the value of the components. They are widely used in vacuum or mechanically operated test fixtures associated with automatic test equipment (ATE). They are also used inside a functional test station as part of a larger production line. Next to test there are many more applications that need a reliable contact, like battery loaders, door switches, docking connectors, interface connectors etc. etc. In this news letter an overview of new products from ECT. All and more on Functional and ICT testing can be found on www.testprobes.nl. New BMP-4 Board Marker Probe. ECT’s BMP-4 Board Marker Probe is designed for installation on bare board or loaded board test fixtures. When your tester is equipped with the appropriate electronics and software, the BMP scribes a permanent circle on every "passed" PCB or device tested. Board that fail the test are not marked. The risk of human error is eliminated in PCB testing and sorting. When activated, the spring-loaded scribe tip contacts the PCB surface. The 12 V DC motor rotates the scribe in a counter clockwise direction and leaves a .050" (1.27mm) circle mark onto the PCB. The probe requires less than .400" (10mm) of fixture area when mounted into a threaded hole. It’s designed to mark board areas comprised of bare glass (FR4), solder mask over glass, copper, or bare tinned copper. The probe features a full length threaded housing which allows for maximum adjustability in the Z-direction. Spare receptacles and tip replacement assemblies are available. New RF (Radio Frequency >20GHz) probe for SMA and direct PCB contact. Read More. Or download here the latest ECT test probe Catalog !! ECT leverages its industry leading experience in probe and receptacle design and manufacture to provide cost-effective and reliable customer-focused solutions for the most challenging ICT and FT applications. ECT receptacles allow for rapid replacement of spring probes without disrupting wiring. ECT’s comprehensive offering of receptacles provides customers with fixture design flexibility that results in an optimal product for their customers. ECT receptacles meet both commercial and technical challenges. PCB testing requires cost effective and reliable ICT and FT receptacle solutions that allow for the replacement of spring probes in fixture without damaging the electrical connection to the test fixture. At the same time, a stable low resistance path through the probe/receptacle assembly must be maintained while withstanding a rugged mechanical environment. ECT replaceable probes are retained by receptacles permanently fixed into a retention plate to which electrical connection is made. 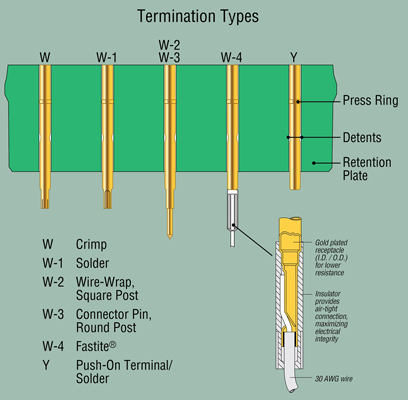 Typical probe retention is achieved by detents in the receptacle or a threaded connection. Removal of the probe does not damage or break the electrical connection to the retention plate and receptacles. More on the ECT website. Or download here the latest ECT test probe Catalog ! !